I think: Is this India? 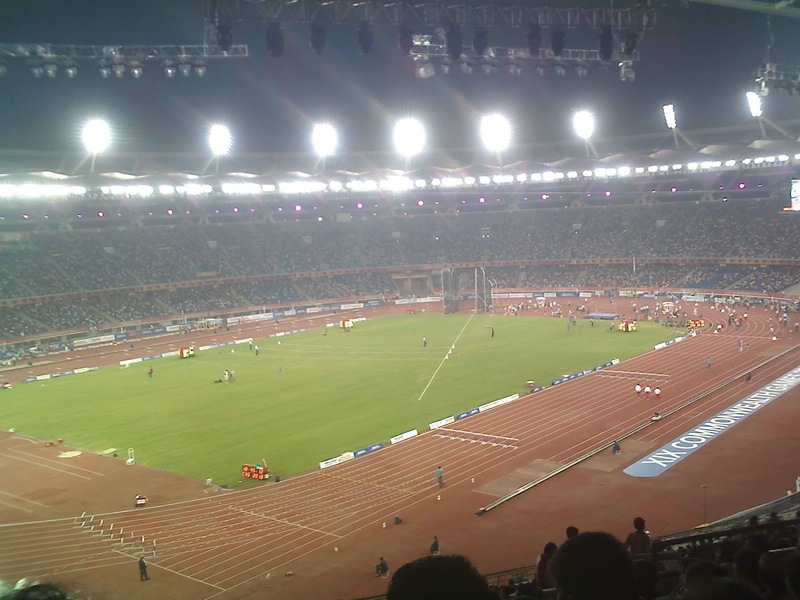 I went to the JLN (Jawahar Lal Nehru) stadium to watch the Athletics events of the Common Wealth Games, 2010 held in New Delhi. Yes, the same games, which were doubtful to happen, which almost created a huge shame for our country. It took hours to enter the stadium and I was thinking of coming back home, every moment till I got into the stadium. No proper ticketing counter, mandatory to take a printed ticket even after booking online, standing in the queue for hours, total chaos at the counter, fights across the counter on the people coming in between the queue, policemen waiting to take out their frustration on the public and what not!, And all this resulting in a major disinterest for watching the matches any more. I didn’t know if I would be able to see the events inside, and even if I was able to get in, didn’t know how much time I would be able to spend there given that we had a specific end-time for the events that day. But when I saw the stadium from the ticket counter once more, I felt if I have come there after a long tiring journey, it makes sense to put in all the efforts to get in and see the stadium, if not the events, at least. Finally, after a hour or so at the ticket counter, we got our tickets and got a chance to get into the stadium. Since it was late, there was little rush on the way at the security checks and others. Slowly, we moved towards the entry of the stadium. Our seats section was just at the place where we entered the purview of the stadium but we misread the ticket and that’s how we got a chance to actually take a round trip of the entire stadium from outside. While I was going round the way, I heard noises which I only heard in the television till then. The roars of the public was just as it is in the television and at some instances, the roars were so loud that I could relate a India-Pakistan final cricket match enthusiasm. It was feeling so good, now I wanted to enter the stadium. Soon, the 400 mts race for females was starting and there was an Indian participant in that. The names were being announced and the moment the Indian name was announced, there was a huge roar around the stadium, and it took me a while to absorb and believe that the crowd is us! The race started and the Indian participant was about 3rd when it just started, and each second, she went on picking up the pace and from then, with her, along her path of the race, moved the roar too in the stadium. 200 mts now and she was the second. Just a few seconds later, she came towards the place where we were sitting and fortunately it was about 1/4th away from the end point of the race. While she was coming towards us, she was almost close to the first one in the race, and within a second, she crossed her and became the first one. With every hundredth second during that second of her crossing the threshold, the roar increased in decibels, and it was a unanimous enthusiasm that was coming out of the crowd, louder, and louder, and even louder, and I am sure it must have contributed to the first-comer Indian by reducing her time for completion by at least a few hundredths of a second. The answer is, Yes, it was the same India, enjoying together, at its. It was the same crowd which was encouraging together to make our country proud. It was the same crowd that had struggled badly for hours together, to get into the stadium, to enjoy this moment of pride. I recollected all the cricket matches in which India performed amazingly, and was thinking what would have been the crowd’s live roar during those matches.